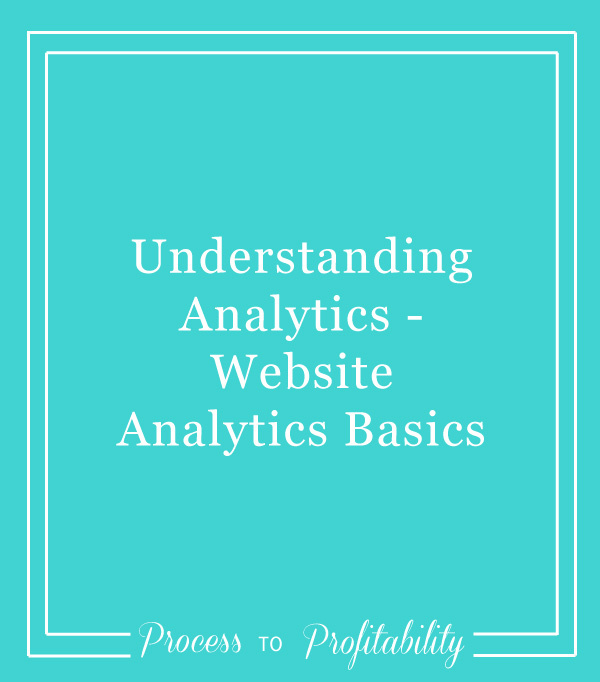 Today I’m going to be talking about understanding analytics – website analytics basics. This episode is an overview of analytics, so there are a lot of topics I don’t cover, but I wanted to introduce this topic and give you information about analytics, what it’s good for, and what you use. I’m going to give an overview of website analytics, what you should be paying attention to, and the 7 most important analytics to look at for your website. I’m also sharing some questions that can help you as you evaluate your analytics, why you need to set up Google Analytics, and what Squarespace analytics are most useful for your website. I’m including a lot of information in this episode, so I recommend that you check out the shownotes where you can find all of this written down in case you don’t want to take notes while you’re listening. Website analytics is the collection, reporting, and analysis of website data according to usability.gov. Basically, they are numbers that give you information about your website and that you can use to make informed decisions. The goal of collecting and examining your website’s analytics is to measure the success of your website at meeting your pre-determined goals. For more information about setting goals for your website, check out episode 25 all about setting goals and planning your website. Why should you pay attention to your analytics? The goal of looking at your analytics is to give you information that helps you make informed decisions about your website. You can use these numbers to help you change the design, write content that will resonate with your audience, know what kinds of products or services to offer, or who it would be beneficial to network with. While analytics can give you data about your website and can be useful if you’re using them over time, they shouldn’t be used as a comparison tool. Your website is your own – it doesn’t matter if you have more or less website visits than someone else, only if your website is serving your business and your audience the best it can. How can you use the information you’re gathering? There are good and bad ways to use the information that you gather from your analytics. What are the most important analytics? What it Does: tells you how many people are visiting your website in a given period of time. What it’s Good for: It’s useful for knowing if your web traffic is growing, stagnating, or decreasing over time, as well as seasons when you might get more traffic than others to help you plan promotions and launches. You shouldn’t use it as a comparison metric. What it Does: tell you where people are coming to your website from. There are a few different locations including organic search (people who find you on search engines), referral (coming from a different website via a link), direct (people typing in your website directly), and social (coming from a social media platform). You can also dig into which referral, social platform, and search engine terms someone is using to find your website. What it’s Good for: This metric is good for knowing how people find you and referral sources you can take advantage of. What it Does: tells you how many people leave your website after visiting only one page. What it’s Good for: This is useful for knowing if your website is giving people the information they want and expect to find and can give you an indication of whether you’re directing people to other pages on your website. What it Does: tells you the most visited pages on your website. What it’s Good for: This is good for focusing your efforts on adding calls-to-action or other conversion events and for knowing what people are looking for when they come to your website. What it Does: tells you where people are first landing on your website. What it’s Good for: This is good for determining where to add a call-to-action to move people forward and where you should include information about what you do and who you help. What is Does: tells you which pages people leave your website from most often. What it’s Good for: This is a good starting point for places to add calls-to-action that keep people on your website. It’s also helpful for knowing if there is content that isn’t popular or relevant that you can update or remove. What it’s Good for: This can help you see the types of people who are visiting your website and if they fit with your dream client avatar. It can also help you focus on your content, and potentially ads, on the people who are most likely to visit and stay on your website. Here are some questions to ask as you evaluate your analytics. You can use these as a starting point to help you determine which analytics to focus on and make decisions about changes you might want to make to your website. Who is coming to my website? Are they my dream clients? How can I take advantage of those sources to bring more people to my website? What are people doing while on my website? How can I keep them on my website longer? What are some ways I can help them move toward my goal? How can I add a call-to-action or next step to help meet my goals? How can I create more content like this? What pages have the highest bounce rates? How can I improve these pages to keep people on my website longer? Are my pages loading slowly? How can I reduce the load time? Google Analytics is a free tool that can give you in-depth insight into many things about your website. It’s worth taking the time to set up even if you’re only looking at a few items right now because it can build with you as you grow. Plus, Google Analytics only starts gathering and storing information after you install it, so if you want to look at it in the future, you need to set it up now. Setting up Google Analytics is fairly easy. All you need is a Google login (either with a Gmail address or your regular email address). You can set up a Google Analytics account for any domain that you own and have access to and then confirm that you own the domain by adding the tracking ID to your website. On both Showit and Squarespace, there is an easy location to add your tracking code without having to add any code. Where do I see my analytics? To see the data gathered by Google Analytics, log into your account and navigate to the property that goes to your website (if you have more than one). From there, you can explore all the data that Google Analytics collects by navigating the menu on the left side of your screen. How can I get the information I need without being overwhelmed? The most important things to prevent overwhelm is to focus just on the analytics that will serve your business. I’ve already mentioned the most important analytics you can look at and you can always add others that are relevant to your business goals and audience. How do I know what keywords people searched to find me (setting up Search Console)? In order to see the keywords that people are coming to your site after searching you have to set up Google Search Console. This is another free tool that you can connect to your Google Analytics account. Log into Search Console using the same username and password that you use for Google Analytics. From there, click Add a Property to add your website’s URL. You’ll be asked to verify your website ownership, which you can do easily via your Google Analytics Tracking ID. While you won’t see any information right away, you will want to make sure that you submit a sitemap. Squarespace and Showit both automatically create sitemaps for you. For information on building and submitting a sitemap to Google listen to episode 38 or read this tutorial. Once you have Search Console set up, you can see your keywords in Google Analytics under Acquisition > Search Console > Queries. Site Search Queries: Part of what is useful about Squarespace’s analytics is that you can see exactly what people are searching for within your site through the Site Search Queries section. You can see what keywords people are searching on your website and the pages they’re being directed to. Form & Button Conversions: This new feature allows you to see which Squarespace buttons are being clicked and the forms that are being completed. This only applies to Squarespace Forms and Buttons (not those you add via code). You can see what was clicked and how many times, as well as how many other views the button or form got. This information can help you improve calls-to-action and see what content is driving the most conversions. Sales overview, Purchase Funnel, Abandoned Cart: If you are using Squarespace as an eCommerce platform to sell goods, services, and digital products directly through your website, these analytics can help you see what people are buying, how they’re moving from just visiting to checking out, and where they might be getting lost in the process. Get the Guide to see example questions, tasks, and my tips for conducting a successful UX test.